Matthew Bates admits he’s far from satisfied with Hartlepool United’s current predicament. Pools recorded only their second win since November last week - coming from behind to win 2-1 at fellow strugglers Barrow. And having seen this evening’s game knocked back around 76 hours due to Bromley’s involvement in the FA Trophy, Pools gap to the bottom four has been cut to just two points. Last week’s victory had seen them stretch three points away from Solihull Moors, but their draw with Halifax Town edged things that little bit closer on Saturday. Despite recent improvements Bates thinks this is only just the start for his squad. 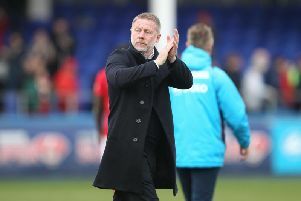 He knows they must replicate last week’s performance again and again to ease the burden of relegation which hangs heavy over the Vic at present. “Last week was one game, one three points and we need to keep that going until the end of the season,” he said. “We are not in a great position, though. “We are happy we have a two point gap but we are not happy that we are in the situation we are. We want it to be better. Having battled to two draws, Pools went one better last time out with a win and they are finally starting to string together the kid of consistent level of performance the management team have so craved. “These kind of performances have been in the players,” said Bates. “It has mainly been about consistency. “With consistency and results comes confidence.